One of my biggest fears when I first learned that Noah was born with Down syndrome was that I wouldn’t get to do all of the fun things dads got to do with their sons. Did children with Down syndrome still like to play? Did they like toys? Did they laugh, smile, and have fun? Would Noah want to play on my iPad one day? Would he even be able to use an iPad? I had no idea what to expect. As a dad, it was one of the scariest moments of my life. Down Syndrome Is More Than A Character On T.V. Our family dog (Gizmo) is a little (a lot!) jealous of Noah! My only knowledge about what it was like for someone to live with Down syndrome came from Corky on Life Goes On, and Becky on Glee. Apart from that I was left with an imagination full of false assumptions about what it was going to be like raising a child with Down syndrome. I guess you could say I wondered if Noah having Down syndrome meant I was going to miss out on some of the best things about being a dad. If you are a new parent reading this I’ll get straight to the point; boy was I ever wrong! This kid loves to play! In fact I have a hard time getting anything done because of how much fun this little boy is! His personality, his smile, his laugh, the way he likes to roll around on the floor to get my attention; it’s wonderful! I can’t get enough of him! This kid loves to play...and I love it! I wouldn’t change one little chromosome on this boy. We love every copy of his 21st chromosome! To parents of children born with Down syndrome, what where were some of the misconceptions you had when you first started on this journey? To everyone else; what are some of your assumptions about people with Down syndrome? Don’t worry, you can be honest. I knew almost nothing about Down syndrome when Noah was born, and I’m thankful there were people in my life who were gracious enough to help me learn (and didn’t make me feel like a jerk when I said something inaccurate, and possibly even hurtful.) One this I hope this website does is help people become more aware about Down syndrome, and what life is like for families raising children with Down syndrome. Every child is unique, but hopefully between our daily one minute videos, the interaction from people in the comments, and hanging out on our Facebook page, we (and by we I mean the thousands of families who are on this same journey) can help the world do away with the inaccurate stereotypes, and move forward with a more clear and accurate picture of what raising a child with Down syndrome is like. I know what you mean. It’s amazing how much I didn’t know. I guess in a way it’s a good thing, because it helps me to be understanding with others who don’t know much about Down syndrome. hahahaahh love it! Another little Holmes! Ill be honest. When I was younger, until I was maybe eleven, I thought people with DS were usually violent by nature, and I was actually a little scared of them. This was based on knowing just one girl in the first few years of my schooling who I now realise was probably never told that her rough play was just a bit too rough. My mind must’ve twisted that into thinking she did it deliberately. Once I was a little older, and met more people with Down Syndrome, I found this not to be the case. I started seeing the true kind nature of “sufferers” (for lack of a better term). It’s interesting you viewed people with Down syndrome as being violent. I usually hear the opposite, that they are all very ‘sweet,’ ‘angels,’ etc. Thanks for sharing. For some reason I used to think I shouldn’t bring it up or something…or that I may offend the person I was talking to. Now I’m learning how much it’s ok to talk about it. It is so interesting that you bring up that you used to think you shouldn’t bring up Down syndrome, and I think that is true about A LOT of people, in many different situations. It’s like talking to anyone who has an obvious physical marking of some kind, I’ll just use a very bad burn for the sake of an example. In a completely well-meaning attempt to make the person feel at ease, I end up looking ANYWHERE but directly at the burn, even if it ends up being more obvious and awkward than just addressing it in some way. I think many of us are worried in those situations that whoever it is (be it a parent or child) just wants to be treated exactly the same as anyone else, and so we DON’T bring it up. It is silly, since it’s not as if the parents don’t know their child has Down syndrome, but I also think it is probably a very human reaction! My daughter with Down Syndrome is 14 now. For me, life changed dramatically, but Not because of my daughter, but because of all the prejudice I’ve encountered. All friends and family DISAPPEARED OUT OF MY LIFE after my daughter was born. I have NO more friends, and my ONLY Family is my daughter with Down’s Syndrome. Life has been a constant challenge for almost fifthteen years now. One great thing about the internet is how much it helps people to learn about people / things / places they may have not have known much about prior. I hope this site, and all the great people who comment, and share on Facebook does just that; helps people learn more about Down syndrome. By the way,I’m using a new comment system, so hopefully you wouldn’t’ mind answering a few quick questions; 1. how easy was it for you to leave a comment, and 2. how did you know I had replied? Did you get an email, or did you come back to the page to check? I remember having a hard time saying disabled. My husband has a disability as well as my twins and it’s just one piece of who they are, not the whole picture. So that word is fine, just like you would say my daughters are female or they are 14, those are just part of who they are not definitions. I think in our quest to be sensitive and politically correct we can go overboard and make words more powerful than they really are. @4ad7425dddcfad79d1bafea85909eeef:disqus I totally agree! It’s like the whole issue with people first language. I’m an advocate of it, and often (lovingly) correct my friends when they don’t use it. However I know they don’t really mean anything buy it. I will say I have become much more sensitive after Noah was born to the things I say. I hope no one gets mad at me for being hones and sharing this, but my wife and I both used to say the word “retarded’ to each other We meant nothing mean at all by it, it was just something we said. It wasn’t until Noah was born that I learned how much this word can hurt other people. About person first language, I’d just like to mention that not all disabled people find it respectful. I’m autistic, and if you call me a person with autism, I’ll correct you. Autism isn’t something I have, it’s a part of who I am. You wouldn’t call me a ‘person with female gender’, but I feel autism matters more to my identity than my gender does. I also find that often people who use person first language see only the person or the disability, when I want them to see both. When we found out Dax had Ds the day after he was born, I was most concerned about how the diagnosis would affect his older sisters. I felt like I had disappointed them in some way- not giving them the perfect little brother we were all anticipating. We explained the basics to them about what Ds is & the likelihood that he would need more time to learn things,live with assistance,etc & they were unfazed. They immediately each asked if Dax could live with them when he was older. In that moment I really knew it was all going to be OK. My oldest is now considering becoming a physical therapist after working with Dax and his therapists. Wow, that’s awesome! Thanks for sharing that. It sounds like you have some amazing daughters. How old are they if you don’t mind me asking? I really like the name Dax by the way! He sounds like a cool guy. Have you posted a picture of him on our Facebook group? We’d love to see him…and your entire family! It also sounds like you guys have a house full of fun! I love it! One of the greatest blessings I have seen is how the siblings respond to the special needs child. My oldest wants to be a special ed teacher when she finishes high school. Yes the sibs need support sometimes, but often they become such compassionate people and open to others much more than other kids their age. That’s great! I really enjoy hearing that. You may have already shared this, but how old are your children? I have a couple of friends from high school who both have kids with DS. They are high functioning, pretty normal little kids. But when I was told after my amnio, that yes, my baby had DS, I immediately pictured this person that would do nothing more than sit and drool and drain our finances with medical bills. Pretty selfish right? I still will get a gut wrenching pang of shame and guilt when I think about how I felt back then. I was of course so very wrong and I am so proud of my little Alaska, I love showing her off! She has brought my world and our family so much happiness! Just so in love with her! I pray that there is a way to get to new parents before they feel so negatively and decide to terminate. This blog is a great start!!!! Im so glad it has become so popular! Thanks for sharing that story with us. I know what you mean. I remember wondering if Noah would be a ‘vegetable.” It didn’t make me love him any less, or think anything negative about him. I loved him no mater what. I was being selfish. I was sad about what I thought I was going to ‘miss out on.’ Sad about what I thought the both of us was going to miss. Sad that Noah wouldn’t grow up like and experience all the things a boy should experience. And sad that I wouldn’t get to experience all of the things a dad should experience. Boy, was I wrong. So glad you, and I, both learned how wrong we were. I hope you know there’s no reason for you to feel guilty. From talking with so many people, it sounds like those feelings are normal. Thankfully they pass very quick. I also hope people who are searching for information about raising a child with Down syndrome is going to be like come across our site. It’s one of the main reasons we started the site. We wanted to show people that Down syndrome was ok.
@cd38f258090b5d51b38db4f9e8f660b8:disqus I almost feel embarrassed for how I felt…but remember, we didn’t know. And the best part is…you decided to learn! Learning is powerful and we all know now just how great a person with Down syndrome can be. Just google online and you’ll find graduates, professionals, wonderful people who are doing everything they can to live the best life they can! I have big dreams for my Enzo, big dreams just like every other parent out there. That’s awesome! What are some of Warren’s favorite iPad apps??? I didn’t have a whole lot of thoughts about it, I don’t guess. A very good friend of ours had adopted a baby with Ds when I was in high school. I remember her being like any other baby, only when she got sick, she got really sick. She is 13 now. Even when James was born, it didn’t bother me. I had actually thought that I would have a child with special needs someday (just preparation from the Lord, I’m sure), so it didn’t shock me. I mentioned before that I did mourn the loss of a daughter-in-law, grandkids, an empty nest someday…these things happen to some people, so maybe they’ll happen for James as well. Who knows. I tend to do best when I don’t think about the things that could happen or might not happen. Enjoy my boy as he is today, and let the future take care of itself! Before I had my daughter, Kara, (who is 16 months old) my only association with anyone with Down Syndrome was a 40 year old man in my church. I realize that the reason people have all these “stereotypical” ideas of DS is because that is really how it used to be. Down Syndrome for your Noah and my Kara is a completely different world than it was for this man’s mother who is now in her 60’s and her 40 year old son. They are the ones that people see in public, and what they see is scary to them. I have watched this man at our church and cried for the waste…for what his life could have been. This mother loved her son, but had no help, no therapy, no knowledge, (he was 2 before she found out that he wouldn’t just outgrow it) no resources, and was advised to just put him away somewhere (which she didn’t do). There was nothing for her to go on or know what to do to help him reach his potential. Of course, he was treated as if he didn’t have any. Our children, and all the others are turning the tide. As they grow and show the world all that they can really be, hopefully Down Syndrome will not be something that is so terrifying and overwhelming, that people will be willing to murder their own babies, rather than face it. I can’t imagine destroying one of the greatest blessings that God ever gave me, because I was that afraid of it. 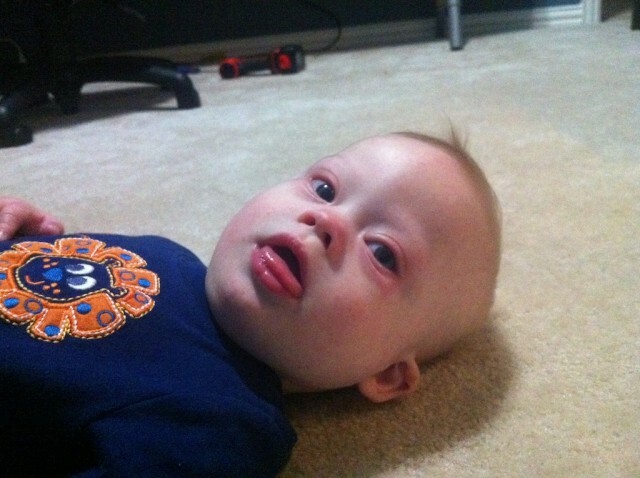 The problem, is of course, that our society doesn’t understand the blessing of Down Syndrome. I believe God has given each of us, not only the privilege of parenting one of His “special” gifts, but also of teaching the world of His “blessings”. You are right about things be much different now than they were decades ago. And I also think this generation of kids, their parents, and all of the tools the internet provides (such as all the awesome families on our Facebook page), really will help the world see that people born with Down syndrome (and other disabilities / special needs) are capable of so much more then people ever thought. Also I hope we can help people become more aware of people with Down syndrome so they aren’t ‘scared’, or feel uncomfortable. I know before Noah was born I wouldn’t have known exactly how to interact with someone with Down syndrome (I still don’t 100%)…it’s not that I was scared or anything. I just didn’t want anything to be awkward, or uncomfortable. Now I know that it’s ok to ask questions. Parents love helping people learn. 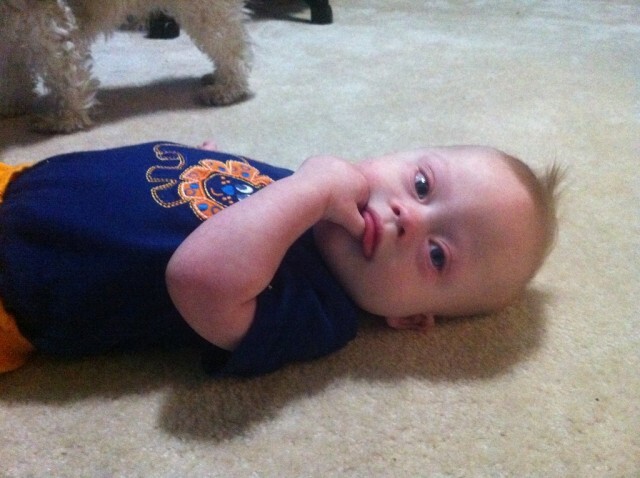 That’s one of the things i tell people now that want to learn more about Down syndrome…..just ask. If you meet a parent, just ask them to tell you about their life, what sorts of things they are working on in therapy, etc. I think the more we get people taking and learning about Down syndrome, the more comfortable they will become. And that’s a good thing! If there is one thing my husband said when Enzo was born….”Thank God it’s 2011, not 1911!” You are right, this is the right time and people with Down syndrome are changing the world! God has blessed us all! I had never been around anyone with Ds in my life. I knew zero and my mind was full of wrong sterotypes. I saw a woman with Ds once that was short, very heavy, pants pulled up to her arm pits, terrible hair cut and her tongue hung out of her mouth. She was being lead around by her care giver. that image stuck in my head my entire life. When we got our prenatal DX it all came rushing back. It took tons of education and seeing with my own eyes the potential that people who have Ds have. The only limitations Journey will have will be the ones I put on her. Sky is the limit! I pray everyday the Lord will equip me to help Journey reach her destiny. I know it’s gonna be awesome. I agree! The sky really is limit for our kids. It will be lots of fun watching everyone’s children grow up. I really like the name Journey by the way! How old is Journey, if you don’t mind me asking? @87ac9c3ae0c6d29b56876f5e999ee11a:disqus I bet you nowadays you see more people with Ds around you and realize just how blessed everyone is! Sometimes even the best laid plans don’t always go the way we’d like them to. I found myself pregnant at the age of 40, and needed a Quad-Screen done. The markers for DS came up way elevated, but I chose not to have an amnio which could have confirmed the suspicions. I chose not to, I loved my baby, no matter what. She is now a feisty, normal 5 year old. I was willing to accept whatever I was given, and have loved her fiercely no matter what. Noah is such a cute, happy little guy who never fails to lift my spirits when I see his picture! You are a lucky man indeed….. When Heidi was born, the paediatrician asked “Do you know anything about Down Syndrome?”? I really thought I knew everything there was to know… I never saw anything like Glee or Life Goes On. I’d read a book when I was young by a boy with DS and I saw a few kids with DS when I went to Kindergarten & High School… I could pick them out of a crowd and know they had Down Syndrome and they were usually a little difficult to understand so I tried to avoid having a conversation with them…but other than that, I knew nothing. I was shocked when I was given a printout outlining all of the medical issues they can have, I never realised it had anything to do with chromosomes or low muscle tone or anything! Growing up four years younger than my sister, I’ve experienced many feelings towards Down Syndrome but in a wacky order. As a child, I didn’t think twice about it. I knew that my sister had DS but what I paid more attention to was who got to be the teacher when we played “School” (she usually got that one) and who sat where on car rides. It wasn’t until about middle school that I began to see how DS actually manifested itself in my sister…that some of her unique traits were biologically rooted in DS. I think that sometime shortly before this epiphany, I even experienced those “selfish” feelings that many above described. As much as I hate to admit it, I think I was jealous of how others would give her more attention or let her do special things. Now that I’m older, I know that my sister deserves this special attention and treatment more than anyone in the world…not because she has DS, but because she has accomplished so much in her life without letting society (or Down Syndrome) hold her back. I have so much respect for the lovely lady my sister is and love her absolutely everything about her! Julia I love your insight. I have three kids my 2 older girls are 6 and 7 and Cara is 4 months. I often think about their thoughts.. I know my big one sometimes has concerns. She is Cara’s protector. My middle one knows but I think forgets. I know their feelings will change throughout time. I love hearing your thoughts. Thanks. I have been thinking about this since you originally posted this earlier today. For me, and probably other parents who don’t have kids with DS, it’s the stereotypes that have to be broken. I am fortunate enough that I met a mom who has a son with DS, thanks to a parenting site, who was born the same month my son was, and through her sharing, the stereotypes are broken. Now, I get angry when I hear them. Ex. All kids with DS are cheerful all the time. Um, no, they are babies, then toddlers, then children with a mind all their own, and will tantrum just like any other child. That is EXACTLY why I follow you now, because it is only through pages (and people!) like this one that the stereotypes and myths will go away. Chapel Flock thanks! One of my biggest hops is that our site, and all of the thousands of parents on this site, can work together to show the world that Down syndrome is ok! It’s not just a hope, you are already doing it! I now know that God gives you what you need, not what you think you want!!! I thank God for Christian Philip Mink every day because he gave us what we needed! 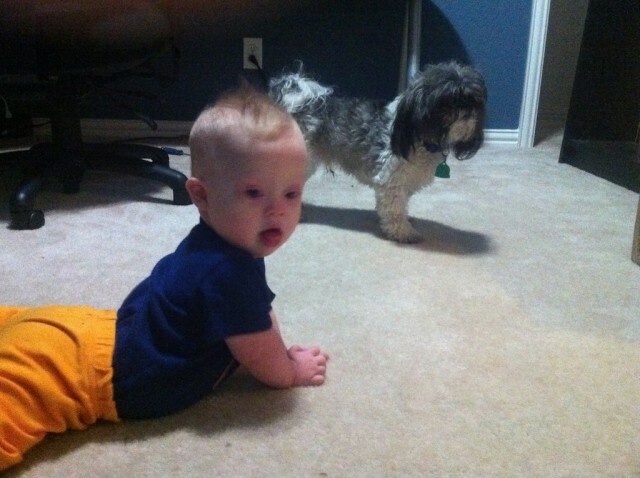 About half of what I know about Down Syndrome comes from “Corky” on Life Goes On – GREAT BLOG!!! I love reading your blog. My son just turned 2 last month. Before he was born having a baby with DS was one of my biggest fears. God has shown me just how silly I was for worrying about it because Reed is such an awesome baby. Now that he is 2 he is doing so many fun new things every single day. He is such a blessing (even as he goes thru the terrible twos). He attends a special needs daycare and gets OT and speech therapy several times a week. I couldn’t have dreamed that everything would go as well as they have. I just love this boy with all my heart! my two older children are “normal” and i honestly can’t tell that children with DS are that much different. anna does things all the time that remind me of the things her sisters did at that age. Georgia Cassidy Mckenzie Some of the ones I wrote on that blog post where some of the ones I had. Others may chime in with ones they had..
TV was all we had when Jonathan was young. Thanks to you, when Noah is Jonathan’s age now (28), it will be “Everything I Knew About Down syndrome I learned from Noah’sDad.com”! Okay so we watched this video about 10 times now! My daughters are in love with Noah!!! They stole my iPhone and would not give it back! (Pics to follow) This post makes me think! What did I know before Syd was born? I only knew what I had learned in my courses in college and that individuals with DS were capable of learning. One thing that stands out to me is after Syd was born I “saw” more people and children with DS. I was suprised that I never noticed them before. I don’t know if it was because I was actively seeking other people out or if it was now I was finally really “seeing” them. All I know is I am so happy to know what I do now and I love my life!! @9ecce6acb9217ca9bb2dd8a394b0b4ca:disqus That’s what I like to hear! Everything I knew was from Life Goes On it was my favorite show in high school. One of the first questions I asked my doctor was if Anthony would be able to drive. I asked that question cuz I remembered the episode where corky was upset about not driving. @facebook-500376777:disqus I’ve actually heard real life stories about people with Down syndrome getting their drivers license. 🙂 Pretty cool, huh? One of my biggest concerns when Eli was born with DS was how it would affect his older sister. I was worked she might not bond with him or that she might grow up to resent him. So far, she just loves her “baby brudder” so much. And I’ve learned that they will probably have a better relationship than I ever dreamed. A good friend of mine, whose brother has DS, told me she was actually kind of jealous that we had a baby with DS–she thinks back on her childhood memories of her brother and how close they were growing up and she remembers it as being so happy. I can’t wait to see how my kids love and support each other! Now I know it will be ok. I love this thread! My daughter is 20 years old so I am a huge Life Goes On fan. I can remember watching it while holding Marissa and crying because the episodes were so real and touching. The one that really stuck out to me and still does to this day is a Halloween episode where Corky is at a costume Halloween party and he is wearing a mask and he meets a girl who is not special needs and they hit it off and spend the night dancing and talking and having a great time. She has NO IDEA that he has Down Syndrome and he does not tell her. They arranged to meet the next day and Corkey was just besides himself as to if he should go to meet her or not. He had a great conversation with his mom about it. Well…he ended up not showing up for the date but he spied on the girl to see if she showed up . Ohhh..it still gives me chills. @147000271ba3df818d0a440d915a4541:disqus Ohhh….I get teary eyed just thinking about. Rick, I am being honest re your many talents. Thank God you aren’t hiding them under a bushel! You are educating the world on special needs children, you have a GREAT sense of humor, you’re humble (except where your great love for Noah is concerned), you write with insight and CONCISELY! Thank you for this community. By the way, we are from Texas also…..where about are you guys form? I’m so addicted to your page and site! I love your little noah!! LOL, I am too, it’s getting a little embarrassing! just passing by to say what a great site this is, got a 20 year old sister that is the light of my life, Saludos desde México. my biggest fear was tht my life was going to change drastically and i was rite it did…..in the most amazing positive loving way ever!!! I know that GOD only gives certain parents children with Downs Syndrome. He gives them to parents that have special hearts and will show the world what true love is all about. My family had 2 very special girls. One was a cousin of mine that lived into her 50’s. The other was a niece that live for 22 months. They truly taught me about unconditional love. We knew nothing about DS until we were told that our son “might” have it, but they weren’t sure because his apgar was so high…our pediatrician called a friend from the University of Washington to come over and check him out, order some tests and speak with us. We were okay with the DS part of it, but were apprehensive about how he would be treated growing up. My neurologist’s wife came to speak with us as they had a 3 year old daughter with DS. We discovered that many respected people in our community had children with DS…Doctors, judges, etc…and that if your child was going to have a disability, that this is the one that you would want. They are more like regular children than not…sure, they wouldn’t grow up to be astro-scientists, but hey, neither did I. Our son has been one of the biggest blessings in our lives. He will turn 18 this year and has been the most loving, easiest to raise child that we have ever had (out of 5). We enrolled him in early intervention at just 3 days old and have never looked back. Not so much a misconception but a sad truth: I used to think that down syndrome and autism wer the same thing. It wasn’t until I really started following your blog that I figured out the difference. I used to think that all children with down syndrome couldn’t read, couldn’t write, couldn’t live on their own but your blog pushed me to learn more about individuals with down sndrome (like the person first language?). I think God has a lot of good things in store for your family. High five to you and your wife for being such an awesome couple and sharing your life (the good’s and bad’s) to shed light into the life of parents of children with down syndrome. You guys rock! @facebook-673609898:disqus Wow, thanks for those very kind words. Seriously. I’m glad there are people like you who are interested enough to want to learn more. Glad to have you along! Do you have any children of your own? No children of my own. I look forward tto having family one day. Right now I’m in college studying special education and early intervention. All your work is super inspiring and I tell my professors and our chapter of the Student Council For Exceptional Children about your blog all the time. Keep up the good work! God has blessed you with an awesome family a story of struggles and happiness to share. You and your wife show a kind of love for God and your son that I rarely see matched. I’m trying to think through portrayals of Down Syndrome on TV. I don’t watch much TV! I can remember one CSI Special Victims show, which I think was the only fictional portrayal on TV I’ve seen, where a girl with DS was fighting to keep her baby after she had been raped and fallen pregnant. She was portrayed very sympathetically, like she would definitely have the capability to be a mum as far as I remember. Otherwise I have only ever seen factual portrayals, like the little boy on Born To Be Different. My only experiences of children with DS was when I was working (I’m a professional storyteller) in a secondary school for children with special needs. I had a little drama group afterschool club there. There were two kids with DS but they had very different abilities. I learned some Maketon signs to communicate with the girl, who had to be really encouraged to take part, but the boy was very creative and really into the drama – just two different characters I guess! They were both lovely! I didn’t learn much about DS itself through that experience as the school didn’t like to tell me what conditions the children actually had. I guess they saw it as private medical information or thought that it might increase prejudice. But I have to admit that when I did accidentally hear what a child had, I always found it useful to do some research and find out about the specific abilities that child was likely to have. There was a girl with Williams there for example – and boy, was she an amazing actress! She could also learn large chunks of Shakespeare by heart after hearing them twice!! Would you prefer professionals working with Noah to have a good idea of his condition, or do you think the school had it right? Also, I want to ask you about one of your lines in this post. You said you wouldn’t change a chromosone in your little boy. Of course you wouldn’t NOW – you know him, and his character, and you love him. But if it had been possible to ‘fix’ the chromosones before birth – if that were an option, rather than the only other option being to abort – would you have done it? Do you think people would or should if it were possible? Sorry for the long comment, thanks for reading and answering! @google-7864a37ff25a7462decd2f6c55de9a68:disqus Thanks for your comment. You’re the first professional storyteller I’ve ever met! Very cool! 🙂 In regards to your first question, I think it’s always best when teachers are aware of how students best learn. Children with Down syndrome do learn different than other children, so I’d like for teachers who work with Noah to understand different learning styles. (Not just Down syndrome, but also ADD, bipolar, and the many other varieties of learning. If that makes sense.) I think the more a teacher knows about how children of all ages, and disabilities (no-disabilites), learn, the better off everyone is. Thanks for leaving your comment. It’s helpful when people like you are honest, and don’t mind sharing honest questions. As always, feel free to ask any questions you’d like. This is a great place to ask them. By the way, do you have any children of your own? I love that you wouldn’t ‘fix’ Noah even if you could. I guess one of the things I don’t know very much about DS is what the longer term physical effects are. I remember the child on V needing operations on his tongue because it was too big, and I think there are heart problems associated with it too? Those are things I would ‘fix’ for a kid if I could. But I wouldn’t want to fix those unique parts of their characters. I imagine it would be a very, very difficult decision and would depend on what exactly was going to be ‘wrong’, and people can never know that for sure! I knew you replied because I checked the page. I didn’t receive an e-mail, but that may be because I haven’t signed in right to comment? I tried signing in with my googlemail address so the system ought to have my e-mail…but I really don’t understand these things…! I ended up having a really interesting conversation with my husband about this post tonight. He’s a priest (pastor) in the Church of England. (I noticed that you mention God and praying quite a bit, but I haven’t read enough of your blog to know much about your faith, so I’m sorry if this simply sounds weird to you!) Anyway, we got to talking about things that should or shouldn’t be ‘fixed’ if they could be, and ended up wondering: what would still exist in the resurrection/heaven, the point at which God has “wiped away every tear” and there’s no more death or pain? Because those things that we reckoned would be gone then, count as imperfections and things that we should therefore strive against as Christians in this world. My husband said that he thought that, medical complaints aside, Down Syndrome was enough of an inherent part of a personality that it would still exist even in a resurrection body. I’m still not sure. If you believe in resurrection/heaven, what do you think? What I didn’t know about DS when my granddaughter was born is that many kids have significant physical limitations. I don’t know why, I just didn’t know that and in fact, was quite surprised by it. From the very beginning Katie was a tremendous source of joy to me. I think I actually worried more about my daughter and the difficulties she would face in raising a special needs child and the health issues Katie has that she has to deal with. Katie is such a loving, adorable child, full of life and hard to keep up with. She also has some problems with aggression. I do see my daughter struggle sometimes, trying to deal with everything as a single mom, it is sometimes overwhelming to her. I keep thinking if only I could retire, maybe I could help her more, even if it’s just giving her more of a break once in a while. Are there any single parents out there raising their child alone who might have some advice or tips? Absolutley love your blogs and your precious little man, it’s such an honour to be able to come along on Noah’s adventures.Thank you for telling Noah’s story. @facebook-1071143291:disqus Thanks so much! it’s great to have you on the journey with us! 🙂 Do you have any children yourself? trying to comment so you can see what you need to. So here is my comment. Why werent you in bed that late at night, lol. I was up around 3 and this is new 🙂 Get some sleep. Also I am not sure yet whether it let me sign on with facebook or not? @yahoo-LF4QIQ2SPX5PLW7DRXWO2VCCYI:disqus I keep very strange hours! 🙂 By the way it doesn’t look like you have it logged in with Facebook. When you clicked on “post as…” there’s an option there for Facebook. When you click that you should be good to go. Let me know if you have any issues. Really weird. Maybe it’s something with your Facebook. The sign up is working fine for everyone else. Sorry you’re having issues. One of the preconceptions of DS I had before Felix was born was that everyone with DS looked the same…pretty silly, I know. Felix (16 months) looks so much like our other kids, and has characteristics and mannerisms just like them! Felix has been the most precious gift to our family (We have 7 older children, 22,20,19,17,15,13 & 11). He has taught us SO much! I burst with pride when I think about him and could seriously talk about him ALL day… Oops…I’m doing it now…..Hahaha! Love the awareness all the families here are raising…it’s great that we can support each other too! The biggest misconception I faced when PJ was born was that he would not be smart. I was wrong. PJ is smart as a whip. His biggest delay (and dare I say ONLY delay?) Probably not but I’m biased. – Is speech, but he sure can sign up a storm, and believe me he knows how to make his wishes and feelings known. On another note, Noah is so so so cute! Love seeing your posts. When I had my Angel “Kristi” I had already been exposed to another child with DS that my mom had babysat for. I had watched Ben grow into a fine young man and was very independent. So as soon as they told me that Kristi was DS I said “OK” and then I said “I hope I can be the parent that Ben’s parents were and she can be just like Ben…independent”. I talked to my hubsand and told him that I felt God only gave special children to parents that he thought were strong and could handle and love a special needs child….so we must be special !!! @facebook-1565348688:disqus Thanks! Yes he is! He likes to have fun. When my daughter Brittany was born, 27 years agom my encounter was a nightmare I will never forget. No one had noticed she had Downs. It was 5 in the morning and a pediatrician came into my room. I was there by myself, because my husband had gone home to rest. The Dr. told me that my daughter had a problem, it was called Mongolism. If she made it to the age of 21 years she would be a good worker. No one would want to take care of her and she would have problems eating and lots of other problems. I was in shock to say the least and started crying. I called my husband and he immediately came back and found the doctor and he was told never to come in the room again. My experience with the geneticist was not very favorable either. He came in a few hours later and gave me a horrifying book on Down Syndrome where the children are placed in institutions. I am so glad I didn’t listen to either of them. I am an educator with a special ed . degree, but I did learn so much throught the grace of God. What did I learn? The more you expose your child to everything in life from church, ballgames, shopping, reading ( which she loves to do, except now the IPAD is her constant compainion. My advice is: Raise your child just like you would a ” normal” child. Brittany has atounded me and everyone she meets. She has her own Facebook account and goes on it everyday. She also works in the library at our school. I’ve always told Brittany, there is nothing you can’t do. I have taken Brittany to see many parents with children with Downs, because the message being converyed today is still one of judging a book by its cover. I love your blog and I am so happy to see it. There are many things about Downs that I have discovered also. If you have a child with Down’s, bring them up to enjoy life and the sky is the limit. God has brought to me a blessing who still surprises me everyday! Thanks for sharing your journey, it breaks my heart that so many probably received the news the same way as you did but responded differently. I have a 10 year old granddaughter Lydia who also has Down Syndrome, and is the joy of my life! I can’t imagine not having her in our lives! I’m sorry your initial experience was so horrifying. No parent should be made to feel sad and hopeless following the birth of a child. It’s a miracle to be celebrated! What I “liked” however, is your determination to give Brittany a typical experience growing up. That is what every child deserves! Regardless of diagnosis, you are allowing her to explore the world and develop into the wonderful woman God wants her to be! Way to go!!! All children should be given equal access to education, to love, to a feeling of wonder and curiosity, and to people who will help them discover who they are on the inside. Keep inspiring! Mia is going to be 3 years old in April. I have an amazing older daughter Autumn who is 15 years old. Mia has mosaic Down syndrome. I am a single Mom. I say Mia came to us as a special gift from God she came with “extra icing and sprinkles.” Mia touches everyone she encounters and spreads the love and joy. We are fortunate to be trusted with her from God, I am thankful everyday for both of my girls God has been so good to me to trust me with to amazing children. Autumn is Mia’s best friend, Autumn is so good with her and even lets her hang out in her room when friends come over. The love between the two will bring a tear to your eye it is so very sweet. Michelle, that’s awesome. Thanks for sharing. I wish Noah had a sibling to play with also…maybe some day! How did you explain to Autumn that Mia was born with Down syndrome? I always find it interesting to hear who different parents approached this. @facebook-1003394772:disqus Awesome. Did you use our old comment system? If so how do you like this one compared to that one? Noah’s joyous little face.. just makes me want to reach in and kiss his little cheeks! By the way, do you have any children yourself? Hello! I don’t have a DS child, but know people who have children with DS. I will be honest, it was something I feared, but, between the people I know, the young man who I worked with who had Downs, and your site, I don’t feel that way anymore. Love your site, and sharing your posts / videos (especially the commercials – “See, we;re more alike than different). My one friend’s daughter who had downs was the most intuitive, loving girl you’d ever want to meet. She had this sense about knowing when I would need a hug and was ALWAYS right! Sweetest girl ever. She, at 8 years old (if I remember correctly) was reading, played the dulcimer and another instrument and was always so polite and well mannered. Thank you for your insight, love, and gift of teaching! I was fortunate to go to school with a boy who had Down Syndrome while growing up. It allowed me to understand a lot about them. Our school educated us as well about DS, as much as they knew back in the 80’s. We were a very small community so he was in the main stream of the school, in that he walked down the halls with us and he went on recess with us when I was in grade school and he graduated with my brother two years ahead me.. When he graduated people stood and clapped for him and he loved it. He went on to live in apartments that allowed him live alone so he was very much like us. He was a great person.. I always felt like we we were more blessed than some other schools or communities because we got to know Greg and he was allowed to interact with us, just like he was just like the rest of us.. He was even allowed to be on the wrestling team in high school. He was encouraged to succeed like we were. Yes, there may be some limitations, but often it is the limitations we put on them, not the limitations they put on themselves. I will always be amazed. I hope I (we – my family) can also spread that same information to everyone as well. And while I think it was only natural to feel saddened when we got the news that our son had an extra chromosome, I cannot help being mad at myself that I even cared when we were given that news. I know, in my heart, that I was worried for him and his future but then it hit me… it was still a time of celebration for our newest family member and that I worry those same worries about our other son. Good thing holding him could just put my mind at ease. I’ve learned so much from out little baby already and he is only 7 months old… AND one of my biggest blessings God has ever bestowed on me (us). i have had a few interactions with people with DS but none of them really ‘in-depth” as in i didn’t really have an opportunity to get to know the people, or didnt really take the time to. my first experience would be with my great, great cousin Jimmy he was much older than me, he was older than my mom even. (my mom and i were both given his last name as our middle name, and i passed that on to my daughter as well) i was not told he had DS i was told he was a ‘mongoloid’ i guess that is what they called it way back then. he would have been in middle age when i met him. i recall only meeting him a couple times as they lived a long way away from us. i remember my mom telling me that the doctors had told his parents to put him into an institution and they said no. he stayed home with them and they taught him everything. i dont think he was even allowed to go to school but he was still really smart. he always let us play with his things when we were there, but he seemed to have a sense about who was good and who was not, he did not allow my cousins to touch his things, as they were rough. 🙂 LOL he was always happy, i remember him watching wrestling sitting in the big chair with his legs crossed and both of his feet on top of his knees, guess he was really flexible. i remember him calling to my aunt to bring him a beer and yelling at the tv like all guys do when they watch sports. i remember him smiling, he was always so happy! the third was a guy at a church i went to. i didn’t really take the time to get to know him. he was always friendly. very talkative. had a job, loved to follow my husband around and talk to him (my husband was one of the custodians at the church) i gave him a ride a few times, as he did not drive but he lived on his own or maybe with a room mate, but not with his family…. he seemed very ABLE to take care of himself. all of these people had different personalities, health issues, characteristics, etc… the one thing that i noticed about them was that they always had a smile on their faces! the happiest people i ever met! we were told recently that our baby (due in june) might have DS we were originally told 1/70 chance and they changed that after the last test to 1/720 my biggest fear is not the DS because i know i will have a happy baby, but the other health issues scare me. and will i be strong enough to handle everything. i ran across your fb page while doing some initial research on DS i live in Canada. i love to look at the pictures and sometimes watch the videos. i have a 20m daughter and was just put on strict bed rest at 20w4d i am now 21 weeks. so i will have lots more time to check out what Noah is doing everyday! thanks for being informational and inspiring. i think the wisdom you share can be used in parenting ANY child not just one with DS! I really appreciate the fact that in so many of the pictures and videos you post of Noah that he looks happy! He’s smiling or laughing or playing… in general, just being a precious little boy who doesn’t know he’s different from other little boys his age. @ellen:disqus Thanks. That’s one of the main things I wanted to do with our website. Just show people that Down syndrome is ok. That it’s not this sad story that so many make it out to be. I’m glad you enjoy the videos / pictures. The experience I had with Ds, prior to Tyler, was a 16 year old foster child who was on my caseload in my first job out of college. I was a social work major and got a job as a foster care caseworker for a child welfare agency. *Mark was super sweet but he was VERY limited. He had to attend a life skills class instead of being mainstreamed and it was unlikely he would ever live independently. As he was the only person I knew with Ds, when Tyler was born, he’s who I thought of and I will admit, it made me sad and scared to think that Tyler might have needs that Chad and I wouldn’t be able to address. I had nightmares of having to send him to a residential facility or something like that. Then, it occurred to me that Mark was 16, about 16 years ago, and things have changed so much for people with Ds. I have not doubt Mark never had early intervention services. Also- he was in foster care because of negelct, so who knows what his potential could have been had he had services and an engaged caregiver. It makes me so sad to think of him knowing that his life could have been different. Thinking about Mark makes me even more motivated to do everything I can to ensure Tyler reaches his fullest potential. Now my real concerns and fears have more to do with not ever wanting to look back and wish we would have done something more or different for Tyler. This was a very thought provoking blog entry. Thanks for posting it!! Trying out the new comment system. Testing it out from Athens Alabama. I’ve got a number of our BUDS group starting to follow y’all (as I indicated a couple of months ago) and now we have a RISE school opening here in April. Full curriculum possibly within a year. I’ll holler at you when I get back to Dallas for a visit and we can pick each other’s brains. On the other hand, this format is SO easy… LOL See you and Abbie at some point. Wow that’s awesome! I think Noah will be starting the RISE school this summer. We’ve greats great things about it. Have you started with a Speech Therepist yet with Noah – or will you not need one? We haven’t yet, but it’s on the list of things to do….soon. I think it’s helpful for all children with Down syndrome to connect with a speech therapist at some time. Do you guys use a speech therapist? How old is your child by the way? This my first comment and hope it works!! I think actually the whole page seems to be working better:) I’ve tried to watch videos in the past and it’s been taking forever to load and even to scroll through the page. Not necessarily a bad thing because I’m sure you’re having a lot of people on your site! Great to see Noah doing his thing….he’s rolling right along! Hello! We are proud parents of a 14 year old with DS. I can honestly say Kaitlin has taught us some valuable lessons as we go on this journey. She is definitely a teenager 🙂 She loves to give her older brother a hard time just like all siblings do. I think my biggest concern is that society does not see our children with DS as individuals. Every person is unique and special in their own way. I have explained to Kaitlin that she has DS because we have raised both our children to not see race, nationality, size, handicap, etc but the person as who they are on the inside. On the flip-side of that token we are trying to instill in her enough self esteem for when other kids are not as understanding. My husband is active duty in the Army so we do move from place to place and have experienced many wonderful people who have made a tremendous difference in our lives. I think the best advice I would want to give to parents would be enjoy every moment. Unlike most parents our children will take a little longer to master some things BUT when they do it is so much more rewarding because we personally know how much hard work and effort our kids put into it. Lastly remember you are your child’s best advocate. You know your child better than anyone. Sometimes I have walked away from Individualized Education meetings (IEP) feeling like such a bad guy but I know that Kaitlin cannot tell them she needs more services.. No one ever told me I needed to be hard headed but helps LOL! Thank you so much for posting the video of Noah. It took be back to when Katie rolled everywhere to get where she was going. Honestly every time he rolled I cheered. You are doing a wonderful job of showing the world that it is not Down Syndrome but Up Syndrome. All the best from New York! My husband and I didn’t know our son had DS until the day he was born. My first thought was I felt guilty. We went through a lot to get pregnant, there wasn’t anything I wouldn’t do to have a child. Then when Ryan was born, I felt like it was my fault for pushing so hard and that my husband was going to hate me. Well I’m glad he doesn’t hate me 🙂 My biggest fear/worry is how he will be when he gets older. I’m afraid to have another child because I’m 43 so I worry that Ryan won’t have a sibling to take care of him when my husband and I are no longer alive. I’ve been stressing about this since the day he was born, and really wish I could magically come up with the answer. Well, to be honest, it was shock horror when I noticed it, I thought I let my parents down ‘their first grandchild’, thought children with DS got bullied in school and abused in day care centres. At the time there was a big story about a swimming teacher that had molested handicapped children for years. After a few days I got used to her and heard better sounding stories, that people with ds go to regular schools and have a loving environment in the event they do have to go and live in a ‘living group’. My girl is a princess and she makes my heart warm with love, I am so proud of her and if we go out she really is a magnet, she laughs and chatters in her own way (she’s 14 months). Ofcourse I make sure she looks like a princess too, she is just the love of my life! I first met people (kids) with Down Syndrome 40 years ago in elementary school. I’m not sure, but I think it was the first attempt at mainstreaming my school did (this was in 1972). I don’t remember being scared of them, but I knew they were different and didn’t attempt to interact with any of them. We weren’t mean to them face to face, but we weren’t very nice when talking about them among ourselves…children are such heartless creatures. Growing up, I guess I thought of people with DS as fat, simple souls who played basketball and bowling alot (the popular Special O sports). As an adult, I now work with people with developmental disabilities and know so much better. They aren’t so different than any one else. I did, in the course of my job, get a chance to meet again, one of the men who was (as a boy) in that Special Ed class all those years ago, and apologize to him for being such a snotty close-minded kid. I didn’t have the moment of realization about my kids disability, because we don’t have a diagnosis and physically they look “normal” it was more of a process for me, a slow realization that this was more than their prematurity. So with me there are no real role models, no guides, we are just different. Well as a mom who’s little further down the road I can tell you those days of fear aren’t over. For me the hardest times are transitions, early intervention to preschool, preschool to elementary, elementary to middle school, and soon middle school to high school. But you get through them, you discover the tools and support to help you and you watch your child rise to the occasion to the best of their ability. And if they do struggle you discover in yourself the strength to find the resources to help or to fight for the help. If I had the chance to speak to every parent with a special needs child I would tell them first believe in yourself, you are the expert in your child and you can do this amazingly difficult and amazingly rewarding task of parenting your special child; second believe in your child. Your child may never be class validictorian and go to some ivy league college, but they are wonderful, amazing, talented and valuable in their own way. Third find friends and support, don’t go on this journey alone. There are people out there that will walk with you, don’t be ashamed or to proud to ask. This journey is hard, there will be days you don’t want to be the parent of a special needs child. For those days you need people who will listen and help. My first thought was also selfish – that I would never be able to have a normal life again or to retire. Through all of the ups and downs we have all grown so much. Now that our kids are moving into their 20’s, I see that my other two kids might not be the quality people they have become had it not been for the blessing of our Down’s Syndrome child. I remember one of first thoughts after Syd as born was wow we are lucky! We felt that our other children would learn so much from Syd and the new life we were given! They would know unconditional love! They would know compassion! They would see the world with kinder eyes through her! Yes I know there will be some tough bumps along the way too. However I feel in my heart they will grow up to be genuinely kind individual! Love your page it has brought so much joy to alot of people and information!!! Thanks everyone for helping me test out the different comment systems on our blog. When you visit the site you will see the Facebook comment system appear up top. Try it out and let me know what you think. I think this may end up being the main commenting system on our site. It's really cool, and makes it super easy to comment. One thing I really like about it is that the conversations from the blog and Facebook merge! So if you leave a comment one one place, people can reply to you on the other and you will still get to see it! In other words, the blog and Facebook combine into one awesome conversation! I think this could be great for us (especially considering how much we all like to share ideas with each other.) Check it out and let me know what you think. Ok lets see if this works…I love this site!!! Cara – Creating Awareness Hey! So good to see you on here! But I'm seeing your comment come through as your page…. @raising Riley – when you enter your comment there is a little box where you can change who you are commenting as. The same thing happened with Sign With Me Virginia-ASL Products and Special Needs Toys and Game Store …but she ended up being able to post as her page. Same with me. I can post as Rick, or as my page (NoahsDad)…Try it again and let me know if you can get it to work. Raising Riley There's a little box in the comment area that says "posting as" and it allows you to change between your personal account and page. Let me know if you can get it to work. Whew, it worked after I clicked the plug-in statement and the format changed. Thanks!! I really like it, also. Brittany Lesch wow…that's cool! I like that. I think this may be a cool way to do comments! I'm replying to this comment on noahsdad.com/ does my reply to you show up on your Facebook page also? Brittany Lesch That's cool. I like how easy it is for people to comment! Nice and simple! Is this the comment area you are talking about? I own SignWithMeVirginia. This is my first time here so I have nothing to compare it with. Hi!! So good to hear from you. Yes, this is the Facebook commenting system. Pretty cool, huh? By the way, it should let you comment as SignWithMeVirginia. When you leave your comment do you see a little box that says "posting as…" ? You should be able to click on change and change it from your personal account to your page. Let me know if it works! Yes…anyone with a child with Down Syndrome or Special Needs check out this cool site and like him on Facebook. Diann Shorter Hey thanks!! You are super cool! By the way, we also like people who don't have children with special needs to visit our site and page. We hope we can show them a different side. NoahsDad.com Well I have all kinds on my site so plug away. NoahsDad.com Maybe we can talk in private sometime and I can give you my perspective on what I have seen in the special needs community I like and don't like. I have grown up around family who were differently abled so I have seen both sides and the problem is not always one or the other. Diann Shorter Wow..that's awesome! So cool! I couldn't pass Spanish in college, so I tool ASL thinking it would be easier…turns out it wasn't. ha,ha…! I follow your family EVERYWHERE! Those blue eyes are just tooooo hard to resist. Thanks….yep figured it out…your blog is cool. If you have any favorite unique toys for kids with special needs let me know as I add ones I like to my store @ http://www.signwithmeva.com. I had opted out of testing and had prepared for anything (so I thought). I don’t remember anything of the first couple of hours and then it hit and oh boy, was I upset. Our entire family goes to bookstores and the library at least twice a week and I thought of how she wouldn’t be able to read – how we couldn’t share that among other things like cheerleading and gymnastics. I thought of all the girly things I’d miss like school dances and a wedding. Wow, this is really hard to write because I know better now and I feel like I’m talking bad about her. 🙁 I can’t wait to have her join gymnastics (as long as her orthopedic appt. goes well). And I look forward to sitting down and reading together. Most importantly, my priorities have been adjusted and I don’t care if she can’t do any of those things. We’ll find something else to bond over and I simply look forward to the person she will grow into. It's so much fun knowing all of these great families (like yours) as we all raise our children. It will be fun seeing them all grow up! NoahsDad.com We need to all go to the same national convention at some point! Melanie Postich Ward Yah, I agree! It makes it so easy to comment, plus our pictures stay in. I like that! No extra log ins, plus seamless integration between the blog and Facebook is awesome! By the way, where are you seeing these replies at? (are you coming back to this page, or do yo used them on your Facebook page?) Also how do you know if I have replied? Are you getting notifications? Or just coming back to check? Rick Smith I got a notification on FB that you commented and then it brought me back to the blog to see the replies. Thanks so much for posting these amazing stories of Noah's life.When my child was born we were told within 15 minutes that she had symptons of Down Syndrome.We were crushed, we didn't know what to think.It was our first child and 15 minutes after birth we got the news. We had the test done and in a couple weeks we were informed that she did have the extra chromosome.To us nothing was going to change how much we loved our little angel. As I research Down Syndrome , I realize that we were gifted with this child and we can live a perfect life together as a family.She is our dream come true. Thanks so much for doing all you do for the worl to know what Down Syndrome really is. And where are you guys from by the way? That is my little girl Kynsee.She was born on 9-17-11.We are from Lake Odessa michigan. OK so, I should be able to comment via Facebook? That's pretty cool. I replied to your reply below…far below…I think my comment is now lost several pages down! Renae Williams 🙂 Hey did you have to go on to the site to reply to that, or were you able to reply right from Facebook? Renae Williams Yah, that's super cool. I'm replying back to you on the NoahsDad.com website (and it's automatically going to the Facebook wall) so yah…that is cool! Renae Williams Oh wow…ok. So how did you make the first comment? Did you come to the page first and comment? Renae Williams cool. I'm glad you like it! I think I may end up keeping it as the main way to comment on the blog. It makes it nice. I guess the only bad thing is you can't see the comments other people post without coming back to the site, right? i did it frm fb…isnt tht awesomly cool??? oh ur rite!!! i cant see other ppls comments!! there's the glitch you'll have to work out!!! lol!!! but yes i like the way the comment/reply is working!!! First of all, I have to say that it was so much fun meeting y'all yesterday. As I told Abbie, Noah is even more precious in person! Secondly, the only first-hand experience with Down syndrome was one of my mother's cousins. Being that she was older than me…by 15 yrs or so…I didn't have much interaction with her. I assume that my great aunt and uncle didn't have much education on Ds, and greatly limited Gracie's independence. Therefore, when we were told about Easton at birth, I was devastated. I thought all children with Ds were the same…very dependent and not able to do much. As I'm learning…and greatly in part to this site…Easton will be able to do pretty much everything that "typical" kids [I'm even learning the lingo 😉 ] can do, just might be a little differently. Seeing all the babies yesterday was good for us, as it was the first time we were able to interact with so many families like ours. So thank you! What you're doing here is so helpful to so many! I've been following your blog for about a month. I found it after hearing the news that my sister is expecting a baby boy with Down syndrome. I love the blog, and LOVE Noah! Noah has inspired me and now I'm so excited to meet my new nephew. Thank you for raising awareness about DS. It's not so scary after all. also in this video it should of been captioned " Doggie ROLL over! Here, I'll show you how..im an expert! I love this post! Honestly, I never had much experience with anyone who had DS…still haven’t (but this blog has made me feel like I do! ), but the first thing that always came to mind when I thought of people with DS is how unbelievably excited they all seem to tackle whatever they need to do. Everyone i’ve ever seen with DS has been so happy, proud, and grateful for what they have. I think that extra chromosome brings quite a bit of wisdom, and a few lessons on how to love life along with it. Wonderful photos! Our daughter Nia was born with down syndrome. She is 2 now and a joy to have around.She makes us all laugh and her older brother and sister can not leave her alone. Hey Natalie, thanks for your comment, and congratulations on your new son! How is he doing health wise? (And how are you guys doing?) Do you have any other children? We look forward to getting to learn more about your story.